Jakobsen’s painting have toured the U.S., Europe and Japan. Widely collected, her paintings are part of a number of permanent collections, including the Smithsonian Institute in Washington D.C., the American Museum of Folk Art in New York, and the New York City Transit Museum. Her work was featured in a twenty-five-year retrospective exhibit at the Housatonic Museum of Art in Bridgeport, Connecticut. She has done many private commissions for individuals and numerous public commissions including the “Easter at the White House” collection, Family Circle Magazine’s “Tree of Life”, “Absolut Jakobsen,” and the “New York City Subway Centennial” for the Metropolitan Transportation Authority. Beginning in 1976, she has completed over 600 oil paintings. Since 1990, with her three children as inspiration, she has done the oil paintings for the critically acclaimed children’s books: Johnny Appleseed by Reeve Lindburgh and the beloved Woody Guthrie song, This Land is Your Land. Her latest book, the new and expanded My New York, New Anniversary Edition, is called “dazzling” by People Magazine and “wonderful” by the mayor of New York City. All are published by Little, Brown & Co., Hachette Book Group. My Washington D.C., a follow up book to My New York, was published September 6, 2016 by Hachette Book Group. 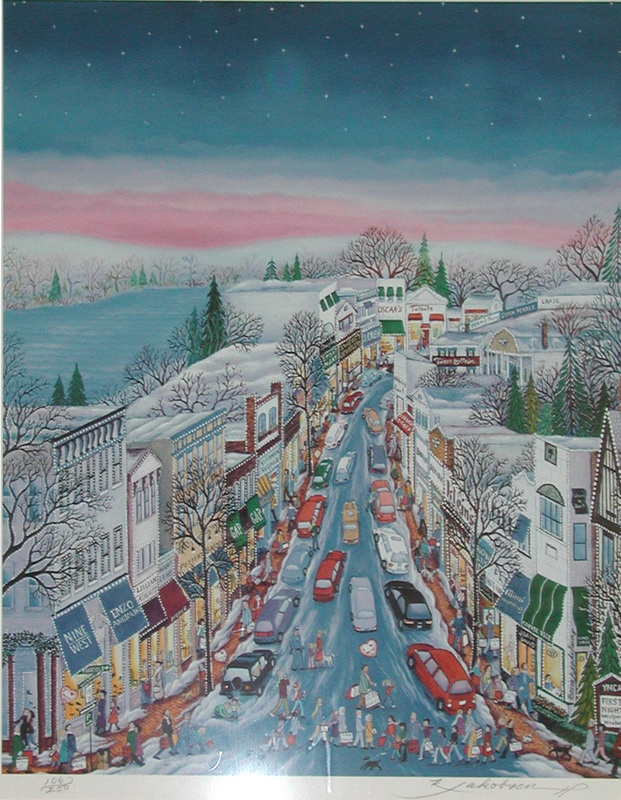 Jakobsen, Kathy, “Main Street, Westport,” Westport Public Schools Digital Collections, accessed April 25, 2019, https://collections.westportps.org/items/show/889.